Have a stress-free marathon day and focus on your race by following these helpful marathon tips! Find all marks, hot spots, water and service stations on the interactive course map! 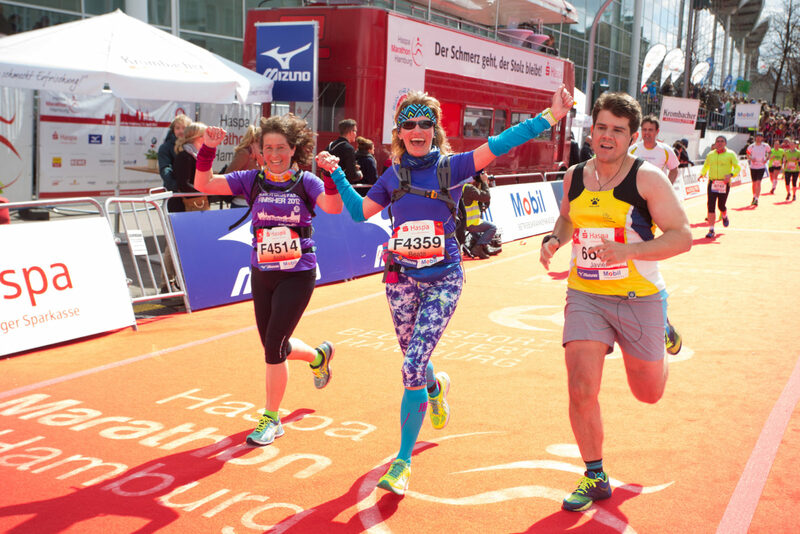 Pick up your race pack at the Hamburg expo on Friday already, so you can avoid stress or long waiting times. If you’re at the expo centre 1-2 hours before the start, you’ll have enough time to get your bearings, drop off your kitbag, and make it to your starting block. You can get to Hamburg’s exhibition centre easily with the “S-Bahn” (S-Line) via the stations Sternschanze and Dammtor or with the “U-Bahn” (U-Line) via the stations Feldstraße (U3), Messehallen (U2) and Stephansplatz (U1). To get to the Athletes Area go to gate B5 or B6 in the street “Bei den Kirchhöfen”. After this point you will be in the Athletes Area, which is only accessible to runners. Ideally, you informed yourself of your starting block’s location when picking up your race pack. Because you have arrived on time, you can now easily drop off your kitbag in Hall B6 Afterwards you procced to the Karolinenstraße to the starting blocks.At your bib number you will find next to the letter of your starting block a coloured point (yellow, blue or red).The runners of the starting blocks A-D leave the Athletes Area via gate B7 and follow the yellow signage. The runners of the starting blocks E and F follow the blue signage via the exhibition area in direction of Karolinenstraße. The runners of the starting blocks G-N follow the red signage via St. Petersburger Straße to the starting blocks at the Karolinenstraße. You should plan at least 20 minutes for your travel time between the kitbag drop-off and your respective starting block. So plan ahead and leave the Athletes Area for the starting blocks no later than 8.30 am. You will find enough toilets on the expo ground and along the starting blocks. Experience has shown that waiting times are to be expected. So make your way to the restroom with sufficient time to then get to your starting block on time. Please also show consideration for oncoming runners in the area after the finish. Even hough every extra step might cause you pain and you have every reasons to want to enjoy the moment, please leave the area behind the finish line as quickly as possible. By doing so, you’ll get your well-deserved medal faster and can then recuperate with plenty of time at the finish buffet. After the Marathon, each and every step is a struggle. However, please try not to fall in line at the first queue of the medal hand out and refreshment points. Most of the time, you’ll find another handout point to the left or right with less congestion. The shower, massage and Kit Bag Collection is located in Hall B6. The Rewe Chillout Area in Hall B7. Please use the the gates B5 or B6 to leave the Athletes Area. Do not forget: If you used a rented timing chip, return it at the gates B5 or B6. Once you have left the Athletes Area and went left, you will find the meeting points in the St. Petersburger Straße. The easiest and also shortest way for everyone is to meet up at the meeting points at St. Petersburger Straße. Now you can take a stroll around the Event Area one more time with your family and friends. After the start you can take the U3 from “Sternschanze” or “Feldstraße” to “Landungsbrücken” – KM 15 – travel time 5 min. Afterwards with the S1/3 to “Jungerfernstieg” KM 16,5 – travel time 5 min. With the S1 to “Alte Wöhr” KM 25 – travel time 18 min. From there with the S1 to “Ohlsdorf” KM 31 – travel time 4 min. From “Ohlsdorf” you can take the U1 to “Klosterstern” KM 37,5 – travel time 11 min. Hurry up and take the U1 back to “Hauptbahnhof” and from there the U2 to the finish at “Messehallen” – travel time 15 min. Here you can relax at the tribune and receive your runner. After the start you can take the U” from “Messehallen” to “Jungfernstieg” – travel time 3 min. Here you support your runner directly at the Hot Spot Jungfernstieg or you go towards the corner “Ballindamm/Lombradsbrücke”, where you can see your runner twice. Afterwards you have enough time to walk to the “Mizuno Zone” at “Stepahnsplatz”. There you can give your runner the final push before the finish. You want to support your relay or you run yourself and want to know the fastest way to the handover points? The two handover points are not that far away. You can walk at the “Hindenburgstraße” and reach after about 18 min. walking the third handover point. Take the exit “Sievekingpaltz – Gerichte” to get to the collection point. PLEASE NOTE. An organized transport of the Women’s Race runners to and from the HANDOFF POINT is unfortunately not possible DUE TO the roadblocks for the marathon. The change zone is therefore selected so that it can be reached comfortably by public transport.